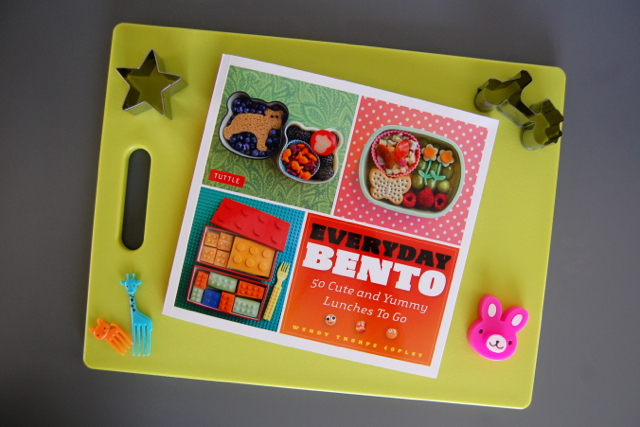 hey jen renee: Everyday Bento + a giveaway! Everyday Bento + a giveaway! A few years ago, I found myself trying to feed a picky toddler. Oh, what fun that is! My little girl was super choosy and in an attempt to help her branch out and try new foods, I turned to bento. I did the usual Googling (this was pre-Pinterest) and found lots of complex bento box ideas ... mostly containing foods she would be hesitant to try. Many of them were extremely detailed, with teeny tiny bits of egg yolk cut into intricate flowers and faces made out of single grains of rice. It looked fun, but yikes. And that was when I stumbled upon Wendolonia. Aha! Approachable, doable bento for people like me! Her ideas were adorable and creative. She had compiled lists of foods to try and supplies to buy. Magic. Every bento lunch I've made ever since has been inspired by Wendy. Right off the bat, Wendy has included bento box basics, techniques, supplies and tools you may need. If you're a total bento rookie (or if you've been packing bento boxes for years) you are bound to learn a thing or two. 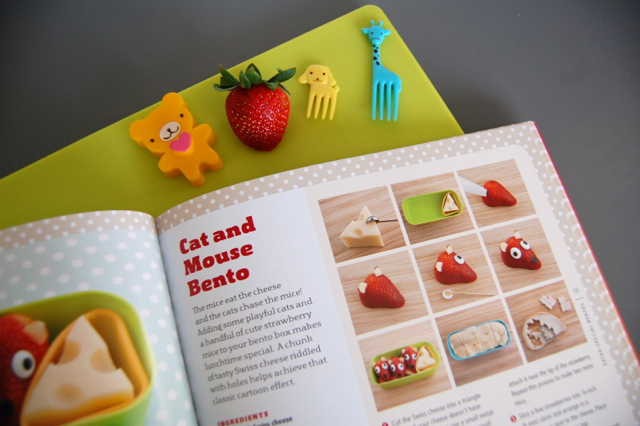 There are lots of fun, tiny things to play with as you start to embark on your bento journey, and Wendy breaks it down for you with thorough descriptions and photos. 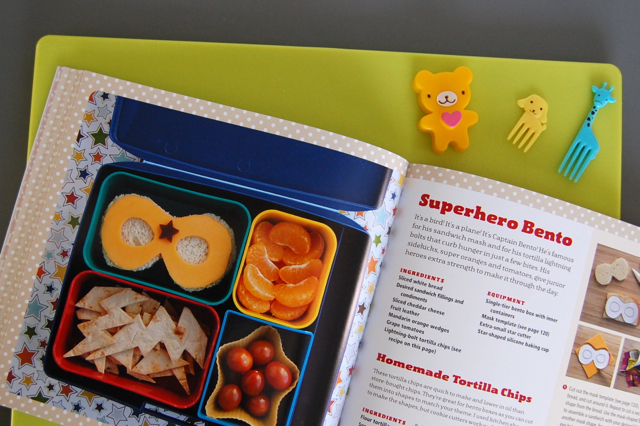 Next are invaluable bento box idea lists and food ideas, grouped by color. She's really thought of everything. I often find myself getting stuck in a rut when I make school lunches, and this book is going to be such a handy resource when I go grocery shopping. Wendy provides lots of step-by-step instructions with fantastic photos to help you make ordinary foods into something totally fun. She includes bento ideas for busy mornings, super fun themes for mornings that aren't as busy, seasonal and holiday bentos, and even bentos for adults. 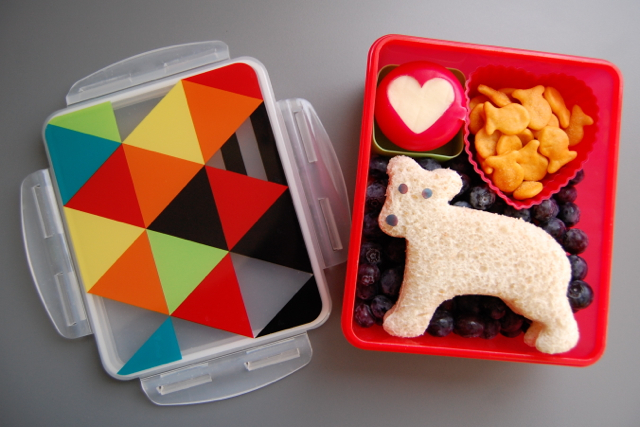 Anyway, here are a few school lunch bentos I made for Lo last week. All of these lunches were inspired by Everyday Bento! Totally fun and totally doable. So. 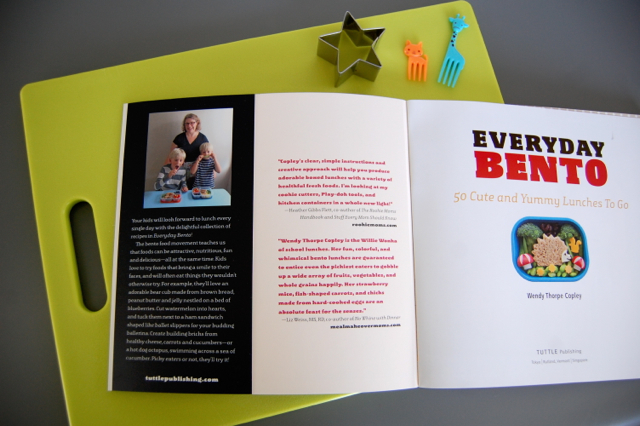 Would you like to win your own copy of Everyday Bento? I know you would. To enter, just leave a comment below telling me how you'd use this book. (U.S./Canada only, please.) Do you have a picky preschooler? 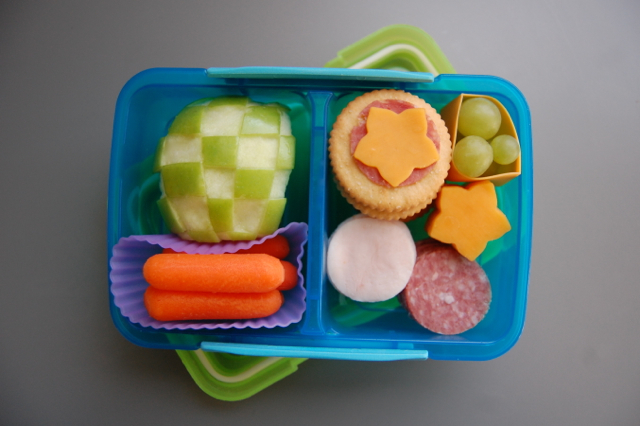 Are you stuck in a rut with your school-aged kid's lunches? Do you need some cool new ideas for lunches that you can pack for yourself for your work day? Really, any reason is a good reason to play with your food. A winner will be chosen at random on Saturday, March 8th at 12:00 a.m. CST. I've been trying to pack fun healthy lunches for my first grader and I definitely get stuck in a rut and then the lunchbox comes home near full with everything a big mess inside. I think I could definitely benefit from this book. My son is 4 and I've never met a child so picky. It seems no matter what I fix, he will want chicken nuggets or corn dogs. Whenever I make him a plate, I'll end up eating quite a bit after dinner is over because he refuses to try anything different. I feel if I had this book, then I'd know of new ways to "dress up" the foods so that he'd be more inclined to try. Let's face it, making lunches is a very mundane chore. It doesn't help to have a toddler who is a very selective eater. 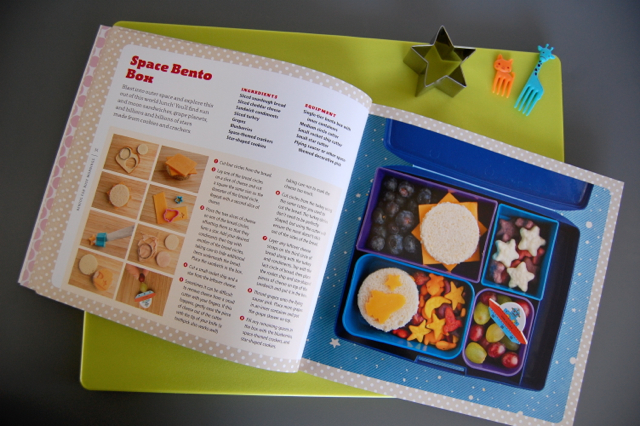 I love the idea of bento since it would allow me to be creative (something I love) whilst feeding my less-than-gastronome child (something that is not easy and therefore not something I love). I'd use this book to get ideas. Our girl (Helena!) is so picky she would exist on PBJ alone if we'd allow her. 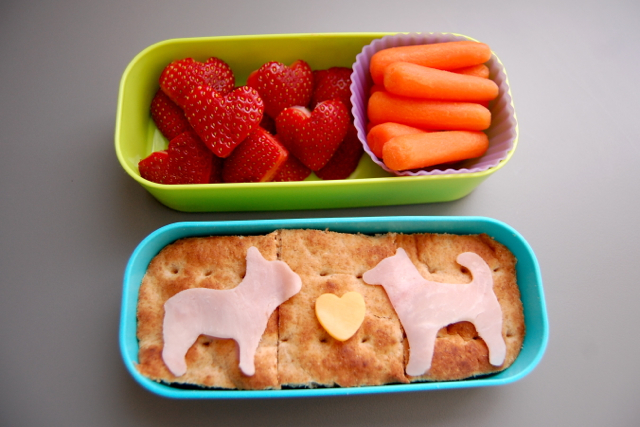 I've found that "cute" foods are more likely to get her attention, and some further inspiration for making fun lunches would be amazing. So neat! I have never heard of this but it looks like so much fun. Jonah is a picky eater (mainly because he won't try anything new) and will be going to kindergarten in the fall. This book would be perfect for this season of our lives. I even think my not-so-picky eater would love this! Thanks for sharing Jen! I'd love to win a copy! I'm always looking for good Bento ideas! I send my toddler's lunch to daycare and I'm always looking for ways to make new foods interesting to him. I'd love some more inspiration! My oldest will be heading to KDG in the fall, so I'm trying to get a head start on lunchbox ideas (because the thought of him eating school lunch makes me gag!). I love the heart shaped strawberries - so cute! I've got a picky preschooler and I'm always looking for ways to get her to eat! This would be great. I would definitely use it for inspiration! I love her blog! I bet this is a fantastic book. Starting next year, I'll be packing two lunches a day, every day. One of my kids will eat anything and everything, the other barely eats any thing. I need a good source of inspiration for healthy, fun lunches. I am in SUCH a rut with my kid's lunch! He is so bored with it and hardly eats anything every damn day. Super cool book!! I need to spice up my hubby's lunches, stat! I have a picky toddler who rarely eats her veggies. I would love to find ways of adding some excitement to her meals and hopely entice her to try different foods. My oldest is starting school in the fall and I know ill need as much as inspiration as possible. A bento box is already on my school shopping list. Chen Chen isn't picky but I definitely need some new ideas! I pack her lunch every day and started off the year all creative and I hate to say it but this week I might have sent her to school with a lunchable (gasp!) so yeah I need some inspiration! My son is only 16 months old, but I guess it's never too soon to start making meals more fun! My use to do this to my food when I was little, I hope to keep that tradition alive! Yup, I just want to play with my own food. And my husbands. Food is fun! I don't really have a picky eater, I am just sick of making the same ole' pb and J's for lunch. I am out of ideas.